Some Good reimagines Newfoundland cuisine, with Jessica Mitton fusing traditional fare with healthy eating practices. Her roast chicken and vegetable recipes are just the thing for cool autumn nights, and might seem especially tempting for those still nursing Thanksgiving food hangovers. Roast chicken or turkey is always a hit in Newfoundland homes and is generally the star dish in what we call a ‘Sunday Dinner.’ The downside, for anyone trying to eliminate gluten, is that the bird is often filled with a dressing made with bread. To get away from the gluten, but maintain that amazing flavour, stuff your chicken or turkey with just the herbs and spices, and hold off on the bread. Served with roast veggies, the succulent taste and texture will be so satisfying, you won’t miss that inflammatory dressing. 2. Rinse chicken under cold water, pat dry with paper towel, and place in roaster. 3. Sprinkle half the salt and savoury inside the chicken and half on top of the chicken. 4. Place half the onion inside the chicken along with the full bulb of garlic. 5. Place the remainder of the onion in the bottom of the roaster, around the chicken. 6. Pour water into the roaster until there is about an inch of water from the bottom. 7. Place the chicken in the oven for 1 hour and 15 minutes, basting halfway through. 8. After 1 hour and 15 minutes, remove lid from roaster, baste one last time, and bake uncovered for another 15 minutes. 9. Remove from oven and place on platter dish to serve. While it’s traditional to boil your vegetables in Newfoundland, for Jiggs or Sunday Dinner, the boiling process can destroy many of the nutrients in your vegetables. Roasting these tasty Newfoundland favourites really maximizes their taste while giving them a satisfying crispy texture, plus you get to keep all those lovely nutrients. 2. Place all vegetables in glass baking dish. Drizzle with oil and sprinkle herbs and spices. 3. 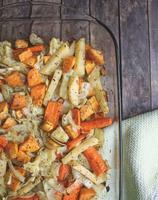 Bake for 45 to 50 minutes or until vegetables are tender, stirring vegetables halfway through baking time. 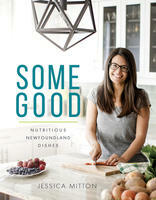 A new kind of Newfoundland cookbook, Some Good is a fusion of healthy food and local traditions. These recipes include appetizers, main meals, sides, desserts, and condiments, all utilizing island ingredients with new twists on Newfoundland classics like fish cakes, Jiggs’ Dinner, seafood chowder, and many more. Every recipe is gluten-free, dairy-free, and made without refined sugars. More than a collection of recipes, Some Good provides a whole new way of thinking about Newfoundland food.